This New York City wedding with a firang bride in a desi saree has taken the internet by storm! 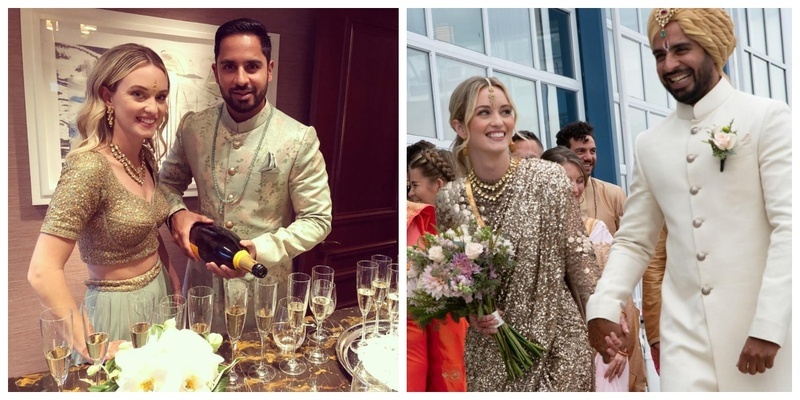 Megan Barren and Rohit Anand just got hitched in an absolutely dreamy wedding at Chelsea Piers in Manhattan, New York and we just can't get over how gracefully this gorgeous firang bride carried her Indian look. She stunned everyone with her the first steps that she took while walking down the aisle in an absolutely gorgeous golden sequin Sabyasachi saree. Megan opted for a subtle off-shoulder dress with floral prints. Even with a dress as simple as this one, she managed to stand out from her bridal crew. Isn’t she just gorgeous? The gorgeous duo wore colour coordinated outfits and looked truly mesmerizing! Megan wore a beautiful pastel green lehenga with golden sequin blouse, while Rohit opted for a subtle pastel green floral printed kurta for the event. Megan definitely gave our brides a beautiful example of minimalistic hand mehndi design. Their love story is the one that cannot be explained under verbal constraints. It’s as beautiful and lovely as the couple itself. The groom wore a Sabyasachi off-white kurta and looked exactly like the prince charming that Megan always dreamt of. Her muted gold sequinned saree had a gorgeous vintage appeal to it. She paired it with a polki necklace and a simple yet beautiful maang tika! Her minimalistic makeup for her grand D-day just took our hearts away! We also collected some really cool decor ideas from their wedding reception. Truly going gaga over these floral and glass decor for the dinning area. The roof of the stage was decorated with hot pink floral tassels and the spherical pendant lamps definitely looked stunning too! OMG! They both look so pretty, I’ll cry! We wish this endearing couple a lifetime of happiness!